Lillian as Princess Wenona, with beloved horse “Rabbit.” This was probably taken around 1915, while she was contracted with the Miller Brothers 101 Ranch Wild West. Image courtesy of University of Oklahoma Libraries, Western History Collection, Nesbitt-Lenders Collection, No. 601. At about 10:30 a.m. on the morning of August 3, 1901, more than 100,000 people jostled to catch a glimpse of Frederick Cummins’ Indian Congress parade at the Pan-American Exhibition in Buffalo, New York. The crowds shrieked with excitement when they heard the Carlisle Indian Band strike up a tune, and drew a collective gasp when three celebrities appeared on their respective steeds. There was Geronimo, the aged Apache chief, and Martha “Calamity Jane” Canary, the frontierswoman and scout of the American Plains. And then there was Wenona, the Sioux girl. Wenona, Cummins proclaimed, was not only the “champion rifle shot of the world,” but also the daughter of a chief named Crazy Horse and a white woman, born in a “tepee on the south bank of the Big Cheyenne, near Fort Bennett, Dakota,” and only 18 years old. Cummins offered a $1,000 reward to anyone who could best Wenona with a rifle at the Exhibition. Her extraordinary shooting prowess, he crowed, had been bestowed upon her by supernatural spirits of the Indian world. In fact, “Wenona” was not a Sioux teen. She was 29-year-old Lillian Frances Smith, the daughter of a white Quaker couple from New England. A former performer in William “Buffalo Bill” Cody’s Wild West show, she had earned the scorn of the legendary Annie Oakley and had been cast aside to make her own way in the world. Lillian Smith, probably age 15. Probably a Buffalo Bill’s Wild West publicity photo. Image courtesy of University of Oklahoma Libraries, Western History Collection, Rose Collection, No. 787. At the cusp of 30, the so-called “California Girl” may have thought that adopting a Native American persona was her last chance to differentiate herself from Oakley. At least, this is what my original thesis was, when I first examined the sparse records that Smith left in her own writing before her death in 1930. I had been casting about for a California figure to write about, and tripped over mention of Smith in a footnote in an article about someone else. I had to piece together a sparse collection of Smith’s letters, newspaper accounts, playbills, accounts of those who worked with her, and genealogical sources to find her “real” story. And her real story, I found, had little to do with Oakley. It was not even so much that a “rehabilitated” Indian could sell a lot of tickets at that time—though that was certainly part of it. As I collected more and more sources, I concluded that the primary purpose of Smith’s transformation into Wenona was so that Smith could completely erase her past and start all over again, in typically American fashion. 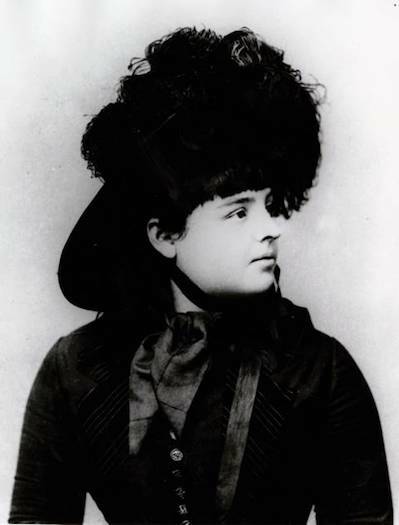 Yet, I learned through my research, Lillian was far less concerned with a feud with Annie Oakley than with getting away from her controlling father, Levi, who traveled with his daughter on the American leg of the Wild West tour. Levi followed Smith everywhere, and prevented her from making friends when he could. Under normal circumstances, this might illustrate good parenting—she was, after all, just a teen. But Levi exploited his daughter, and later, her younger sister. I found many examples of this, but perhaps the most poignant is mentioned in a letter Smith wrote to a friend, lamenting her sister’s situation: “The best thing she [Nellie] could do would be to marry or go with some man who was smart enough to manage her—else she will never win with this old man around her neck.” This is exactly what Lillian did when she married the cowboy “Kid” Willoughby, who was a dozen years her senior, in 1886. By marrying Willoughby, Smith put a trusted friend in charge of her finances and virtue while overseas, and pushed her father out of the picture. By all accounts, they were smitten with each other, and Willoughby staunchly supported his wife when Oakley and husband Frank Butler took her to task in the newspapers. Lillian Smith as Princess Wenona, taken at the 1901 World’s Fair in Buffalo, New York. Centered in the photo is Geronimo. An inscription on the photo says, “General Milles–Indian Congress,” probably meant to commemorate General Nelson Miles’s winning of Geronimo’s surrender in 1886. Image courtesy of Library of Congress. The marriage failed in 1889 when Willoughby left with Buffalo Bill on a second European tour and Smith did not—possibly because Oakley made Smith’s absence a condition of her own return to the show. Newspapers hinted at Smith’s dalliance with a “half-breed” as the reason for the breakup, but it is more likely the young sharpshooter simply lost interest in marriage with Willoughby so far away. Levi Smith immediately took control of his daughter’s career again, and the family traveled up and down the West Coast, living off Lillian’s exhibition earnings. In 1897, Smith impulsively married a saloonkeeper in Santa Cruz, and just as quickly left him when she met Charles “Frank” Hafley, sheriff of Tulare County, at a gallery in Visalia the following year. Hafley was not conventionally handsome, but he was witty, athletic, and very intelligent. Additionally, he was an extraordinary sharpshooter in his own right, and a very competent equestrian. The two may not have ever legally married, but they began a decade-long romantic and business partnership that packed in more adventure than most people saw in their lifetimes. They traveled to Hawaii as a sharpshooting act, to the East Coast to perform at the 1901 World’s Fair, and to the Jamestown Exhibition in Virginia in 1904. The pair even created their own program called “California Frank’s Wild West,” and started an Indian curio business on the side (Smith created her own brand of tomahawks). 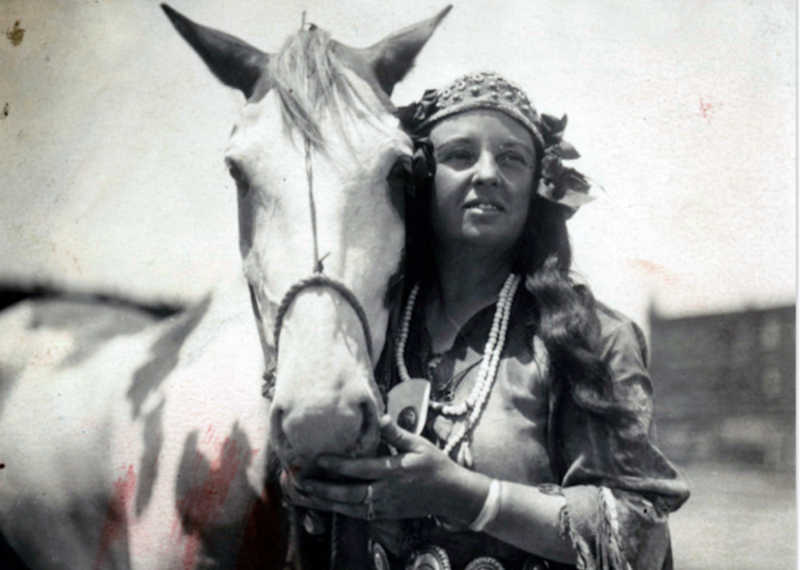 It was Hafley who helped Smith morph into “Princess Wenona,” helping her write a “new” biography that included him, “Fighting Frank” Hafley, as the cowboy who brought this fair Indian maiden into a culture of civilizing whites. Wenona’s costume often included a fully fringed, suede tunic with intricate beadwork and a fantastic feathered headdress, which she wore even while shooting moving objects while astride a galloping horse. Her “Indianness” helped differentiate her among other Wild West stars, but her costuming was also practical. Smith had struggled with her weight since puberty, and her tunic let her hide her voluptuous figure. Additionally, it gave her freedom of movement to do the physically demanding feats she was known for, like shooting glass balls thrown all around an arena while galloping full speed on her horse while flipped on her back. Perhaps most importantly, Wenona’s adopted Sioux identity forever severed any connection between her and her parents. In 1900, we know from one of her letters, she was still trying to convince her younger sister to leave Levi’s sphere of influence on the West Coast and move east to be closer to her. The Smith girls’ mother died in 1901, and their father in 1908. Wenona did not see either of them again after she met Frank in 1898. Lillian Smith as Princess Wenona. Publicity photo from Pawnee Bill’s Wild West, circa 1905. 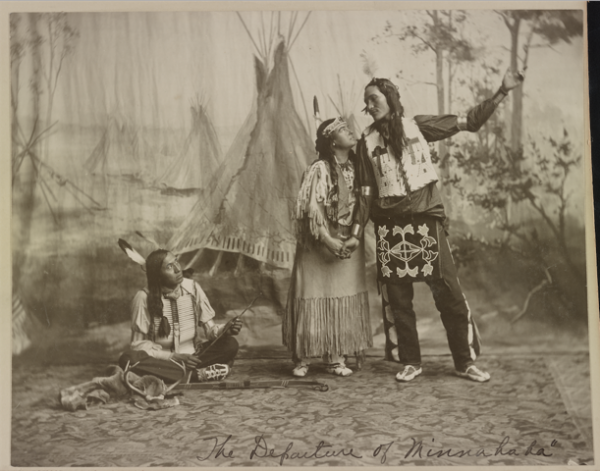 In this image, Wenona is Minnehaha, the fictional Native American woman in Henry Wadsworth Longfellow’s 1855 poem “The Song of Hiawatha.” Image courtesy of Library of Congress. Audiences were more than willing to receive Wenona as a member of a “noble race,” albeit one doomed by the progress of civilization. 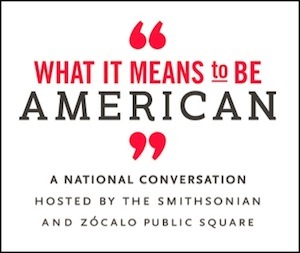 As Philip Deloria, Laura Browder, and other historians describe it, Native Americans were icons of American identity, and citizens wanted to feel a natural affinity with the continent. Indians could teach them such “aboriginal closeness.” Lillian Smith was not the first or last performer to try to bridge this gap. In her book, Real Native Genius: How an Ex-Slave and a White Mormon Became Famous Indians, Angela Pulley Hudson describes how in the mid-1800s, Warner McCary and his wife Lucy, who was not only white but divorced, traveled the United States as singers and comedians before turning to lecturing on medical healing. They used “Indianness” as a way to disguise their backgrounds, justify their marriage, and make a living—much as Wenona did. 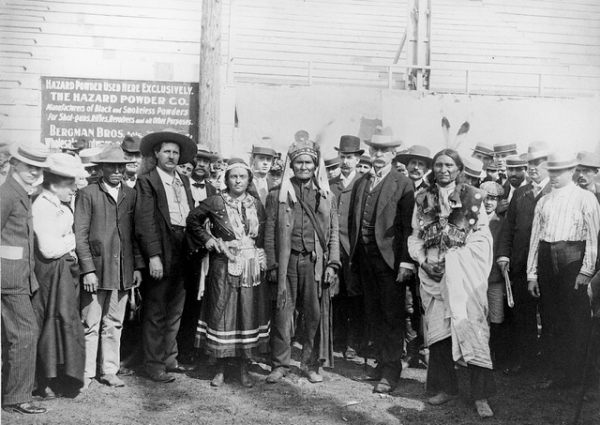 Smith’s popularity spurred a number of wannabes on the Wild West circuit: “Princess Kiowa,” “Princess Winonah,” “Princess Mohawk,” and others. One notable “Princess Kiowa” was Nellie Smith, Lillian’s younger sister, who was also an accomplished sharpshooter, but was never quite as good or as famous as her older sister. Nellie fades from the historical record after 1916, when she was performing for Yankee Robinson’s circus. Wenona retired from show business in 1925 or thereabouts. She had a brief relationship with cowboy Wayne Beasley just before World War I, but her last substantial romantic entanglement was with Emil Lenders, one of the great painters of the American West. Lenders had also “gone native.” His first marriage had ended when his wife could no longer tolerate his traipsing off with various tribes instead of helping to take care of his family in Philadelphia. He had first met Wenona at the Buffalo Exhibition, and got reacquainted with her around 1920 when Joe Miller of the Miller Brothers 101 Ranch in Ponca City, Oklahoma, brought Lenders in to paint buffalo and other animals. Wenona had performed with the 101’s traveling wild west since 1915, and Joe Miller generously allowed many of his performers to live on the working ranch. It was only natural, when Lenders and Wenona fell in love, that they shared a house there. The couple parted ways amicably in 1928, when Lenders met and married another woman. Wenona lived on in a tiny cabin on the outskirts of the 101, and passed the time caring for her many chickens and dogs. At age 59, she developed a heart condition, and quickly deteriorated over the Christmas season of 1929. She still always wore her Sioux garb, and asked to be buried in it upon her death. When she passed away in February of 1930, her friends obliged. Julia Bricklin is the author of a new biography of female sharpshooter Lillian Frances Smith (University of Oklahoma Press: April 2017), and has authored articles for commercial and academic journals such as Civil War Times, Financial History, Wild West, True West and California History. Bricklin grew up in Southern California, obtained a journalism degree at Cal Poly, San Luis Obispo and worked in the TV/film industry for 15 years before obtaining her Master’s degree in history at Cal State Northridge. In addition to serving as associate editor of California History, the publication of the California Historical Society, she lectures in U.S. history for her local community college district.